By Hannah Tuthill-Hogan | March 6, 2012. 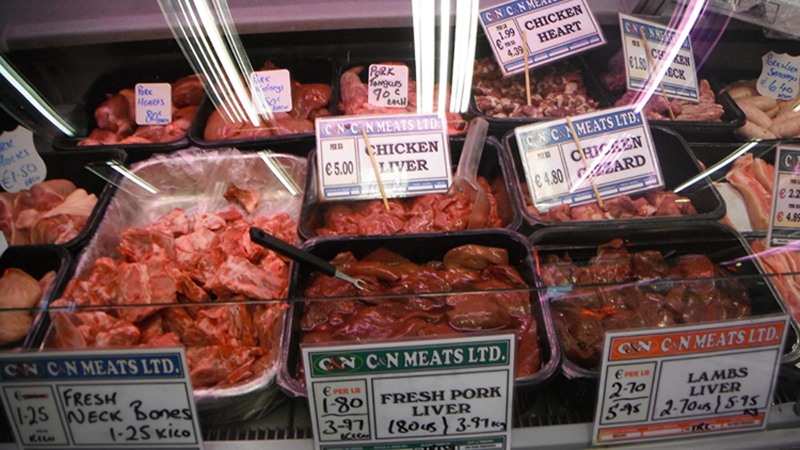 Old fashioned cuts of meat such as shin beef, offal, pig’s trotters and chicken heart fell by the wayside during the Celtic Tiger years when people favoured sirloin steak over chicken gizzard and pig’s ears. Over the past few years in Ireland old fashioned cuts of meat have risen in popularity, this is thanks in part to the recession which has left people with less money in their pockets. But since the recession people chose to return to a simpler time when coddle or tripe and onions were a welcome sight at the dinner table. He says that there has always been a demand for cheaper and less fashionable cuts of meat in the area, even during the Celtic Tiger era. The butcher shop has a huge range of meat and he says this helps his business. Peter Byrne’s butcher on Camden Street has been serving the people of the Liberties since 1866. Ronnie, who runs the butchers and whose father ran it before him, thinks that people are opting for cuts that are quicker to cook. These age old cuts of meat are not only rising in popularity due to recessionary cutbacks , there has also been increased interest in these cuts of meat as it is now in vogue for high end restaurants to specialise in making old school cuts of meat into appetising and fashionable gastronomic delights. Bear Dublin, a new restaurant opened on South William Street, is owned by restaurant heavyweight Joe Macken along with Leinster and Ireland rugby player Jamie Heaslip. Their forte is in old fashioned beef cuts such as onglet, bavette and feather beef. So if you still savour the thought of lamb’s liver or chicken heart, don’t think of yourself as a culinary outcast but instead as a chic carnivore.